Today is February 25, which means it's time for the annual Baikasai Festival at Kitano Tenmangu Shrine in Kyoto. As I write this, the geiko and maiko of Kamishichiken are serving tea to the people who attend. It's probably a bit larger crowd than usual since today is a Sunday, and the crowds are already quite large! 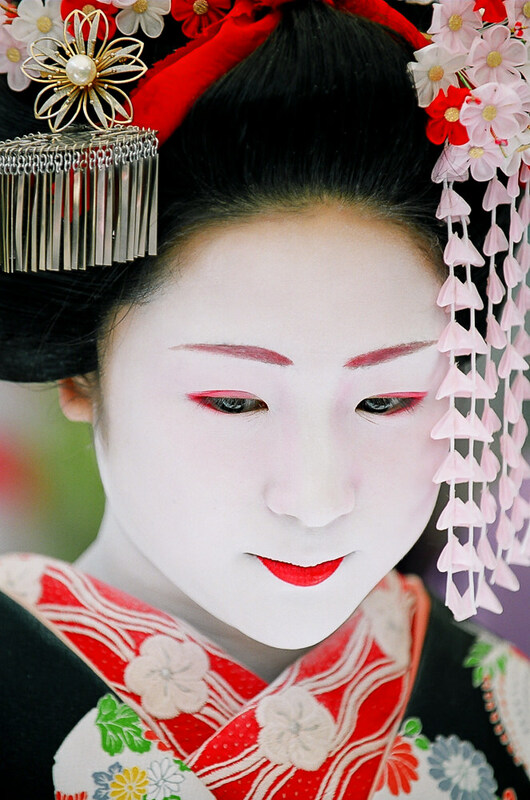 I'm sure many photographers will be posting photographs in the coming hours and days of this year's Baikasai all over social media, but I am posting a portrait here from 11 years ago of the then maiko Katsuru. As I searched through my archives looking for an appropriate photo, I was struck by just how young Katsuru looks here. I hope you enjoy the portrait as well! I did not encounter Katsuru again until 2014, when she was already a geisha. I was working as a specialist guide and lecturer on geiko and maiko, and Katsuru was one of the geiko entertaining at the event. When Katsuru introduced herself to me, she was surprised I spoke Japanese and lived in Kyoto. The group I was with consisted of visiting Europeans, so Katsuru thought I was a member of the group. I didn't expect her to know anything about me, but I told her a little bit about my background and showed her the cover of my book One Hundred Views of Maiko and Geiko on my iPhone. Katsuru suddenly became very animated. "You wrote that book?" she said. "I have that book! It's on my bookshelf at home!" I thought then that it would be a good idea to photograph her even though I had missed all her years as a maiko. Unfortunately, I found out only a few weeks later that she would soon be ending her career as a geiko. I missed the chance to photograph Katsuru except for this one time in 2007, but I am glad I had the opportunity to talk to her once! I have only attended Baikasai 4 times in my 16 years in Kyoto, and the last time was 2 years ago in 2016. Unfortunately for photographers, many changes had been made to the event that made photography very difficult as compared to years past. First, they changed the location of the event within Kitano Tenmangu Shrine. I didn't think the background of the new location was as appealing as the old, and the new location didn't seem to get as much sunlight, although that could just have been the weather and time of day I happened to be there. Second, photographers could always stand behind a rope just outside the area where the maiko and geiko were serving guests tea in previous years, but there was no rope nor area for photographers to stand in this new location. As I reached the front of the line I could have made some photographs if I had wanted to, but it just wasn't the same to me. Finally, when I was seated, I made the mistake of drinking my tea as soon as it was served to me. Within seconds of me putting down my empty cup, a geiko came right up to me and asked me to leave. I asked if I could stay for just a minute (to enjoy the atmosphere, not make any photographs) and she told me it was very crowded. I understood, and I left. I think if I had waited to drink my tea, I could have had another few minutes, but not much longer. This was also quite different from even the year before, in 2015. Guests were always allowed to linger for a brief time, but not as of 2016. I thought it might just have been me, but as I was leaving I saw a customer from one of the ochaya I go to waiting on line. I saw him a few weeks later, and he agreed with me that the atmosphere at Baikasai had indeed changed. If any photographers have been to Baikasai in the last year or two, I would appreciate your thoughts on how you found photography at the event. I know some photographers come from outside Japan just to photograph Baikasai, and I don't think they will have as much success now as they would have in years prior to 2016. I hope someone can prove me wrong, though!